With the possible exception of the early episodes of the 90's X-Men cartoon, nothings come close to the longer lasting chew of Paul Dini's Batman: The Animated Series. Not only did it inflict Harley Quinn upon a world who never knew how badly it needed her, it is also home to definitive stories for The Riddler, Batgirl and even Bats himself. 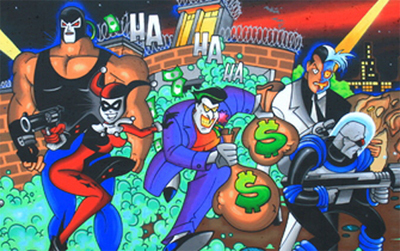 So wide was the influence of the non-watered down for kiddies Bat-toon, it even inspired this Swedish street art of the whole cast - even Killer Croc! Click to enlarge. Believe me you want too. It makes me want to have a Batman Animated Weekend Random - at least for Harley episodes!